It's Ferrari's day as Kimi Raikkonen tops second practice. Could they be about to take the fight to Mercedes? It's time for us bring the curtain down on our coverage of Friday practice. Head here to read Andrew Benson's report and join us again tomorrow at 04:30 BST for final practice. Oh, and the team that has won the most races in Shanghai? Ferrari, with four. "What a session by Ferrari. Maurizio Arrivabene cannot wipe the smile off his face at the minute." 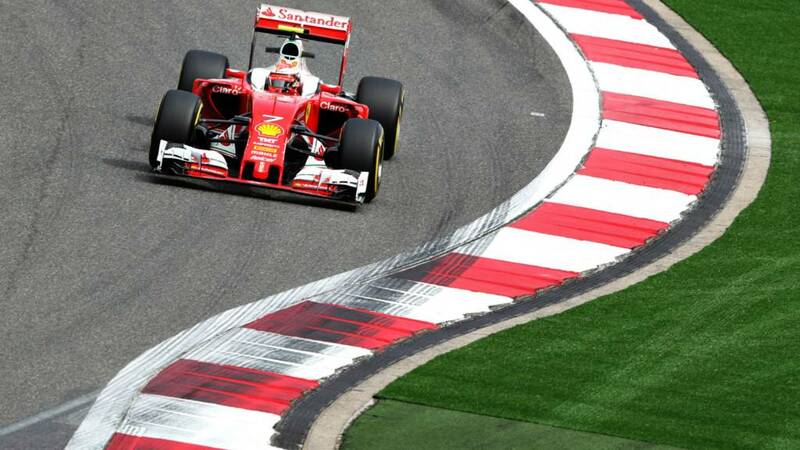 Kimi Raikkonen finishes fastest in second practice for the Chinese Grand Prix. The longevity of the super soft tyre will improve as more rubber goes down on the track. Ferrari I imagine will be encouraged by the life of the super soft. Sebastian Vettel is on his 16th lap on this stint on the super softs, but his times have dropped off massively, his latest effort a 1:50.814. A couple of moments for Lewis Hamilton as he runs wide at Turn 6 and then locks up at Turn 14. Meanwhile, Fernando Alonso is done for the day. He is out of his McLaren and slapping on a baseball cap and some nifty looking shades for the final two minutes of practice. After that bit of 'boogity' Jenson Button is out of his McLaren now but Fernando Alonso is still out there, 17 laps to the good on a set of softs. Boogity is a good word. I feel compelled to start using it more. A bit of British battle going on between Jolyon Palmer and Jenson Button. Palmer overtakes at the end of the long straight but overcooks it into Turn 14 and Button nips back ahead. Palmer has another go, running alongside Button before a brief foray off the track. "Happy to try the other wing," says Romain Grosjean. Haas are too as in goes the Frenchman and the switch is made. Daniel Ricciardo completes a 12 lap stint and heads in. He had been lapping in the 1:44s but from lap seven onwards the drop off was quite dramatic. Otherwise known as "go get a coffee time". "Looking at Mercedes, one driver is on the soft tyre and one is on the medium so that will help them get an overall picture on how tyre wear will affect them on Sunday. Why have Mercedes changed policy for this race? The conclusion I think is that they see Ferrari as a proper threat at this race. They need to see the overall picture because they need to stay ahead of Ferrari." Ferrari, and in particular Kimi Raikkonen, are clearly very popular in China. That model isn't very lifelike, though. His celebration is far too enthusiastic. "I have been watching Daniel Ricciardo's last three laps and has done 1:44s pretty consistently. That's after six laps on super softs so now we need to see where it goes in terms of a drop off." Both Mercedes reach the end of their stint on the super softs. A big drop off towards the end as Nico Rosberg's 13th and final lap on the red walled tyre is a 1:51.8, while Lewis Hamilton's is a 1:50.2. Rosberg is back out on softs, while Hamilton has gone for mediums.